The death of a child affects the whole family, especially the parents and their relationship. The journey of grief has no set timeline or steps. Rather, it unfolds as each person travels in their own individual way. This book focuses on the effect parental bereavement has on the couple and their relationship. Most of all, the book is about together embracing a life of joy and melancholy, laughter and tears, happiness and sadness. Not either or, but AND. 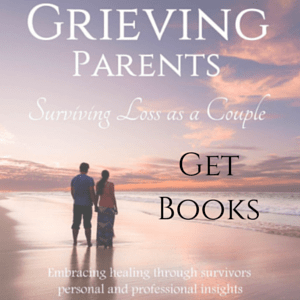 Surviving Loss As A Couple takes you through the steps to survive the darkness of grief and child loss. The goal is to help couples emerge with a renewed depth of relationship and understanding with your partner. Your relationship as a couple can – and will – be affected by grief. This book provides ways to support yourself and each other through the process. Grieving Parents is based on bereaved parents’ needs, challenges and detailed descriptions of what has helped grieving couples. The couples interviewed for this book include varying situations and different stages of their journey with grief. The goal of this book is to bring awareness to the process of grief. In reality, it is one we will deal with sooner or later in life. My wish is that in breaking the silence we enable society to be more open and understanding with each other. We must allow and accept the experience of grief, however it may be expressed. I hope my sharing will encourage more supporters to stand strongly with someone experiencing emotional pain (grief or other). More importantly, stand with them without the urge to fix or make them feel better before they are ready themselves. I found Nathalie’s book ‘Grieving Parents’ such a great help in understanding the unique and individual way men and women grieve. Also, the book served as a guide showing how to start to live again as a couple in this new normal. Throughout the book we discovered invaluable, heartfelt insights from other real life couples’ personal story of their journey through loss. The book was so helpful, I decided to purchase a second copy for my grief therapist’s office library. Please share this amazing book and knowledge with other bereaved parents to help them heal and make life a little gentler. – Leah B.